Mix weird electronics, violin and math-rock drumming and you have Vložte kočku (= Insert Cat), one of the most original bands coming from the Prague alternative rock scene as of late. They started in 2008 and have become a sort of hub for various other projects (instrumental rock of Kaplan Bros., experimental rap of Mutanti Hledaj Východisko). 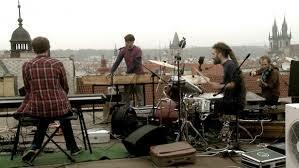 The home band, however, attracted the most praise – both for their visceral live shows and one-of-a-kind recordings mixing rock energy with sample based electronica and elements of Czech folk and pop music. Vlože kočku’s debut album TáTa (2012) was released as a USB flash disc and got shortlisted for an Anděl Award in the electronic music category. The follow up SEAT (2013) received Album of the Year at 2012’s Vinyla Awards.